So next time you face a situation that demands a temporary or repetitive fastening, fixing and bundling solution, there’s no need to throw away and re-tie with a new tie. HellermannTyton has a tried-and-tested team of professionals you can rely on to deliver a winning result. 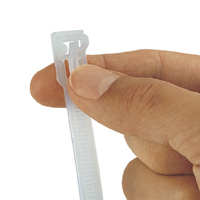 When we think of cable ties and zip ties, we usually think of products designed to be closed once, permanently. But there are a lot of situations in everyday life that require ties that can easily be reopened and re-used. 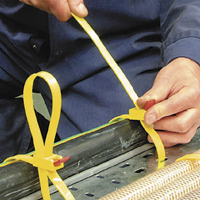 Specific applications even prescribe the use of releasable ties, such as securing the doors of transport boxes for animals in aircraft. Consider also events on music and theatre stages or at trade fairs where equipment is built, secured and dismantled in quick succession. Or think about the number of times containers, sacks and bags used in the catering industry need to be opened and resealed. 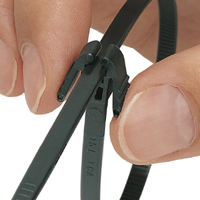 Here it makes sound economic sense to use cable ties that can be opened and closed more than once in their lifetime. Repeated use saves money and waste. A short video on HellermannTyton’s YouTube Channel introduces a range of releasable and reusable cable ties, for the video click here. Over a number of years, these products have been designed and optimised successively to the requirements of customers for non-permanent fastening and bundling in a wide range of industries. The RELK and RLT and LR55 ties feature an extended “trigger” which allows them to be released and re-used securely and efficiently. 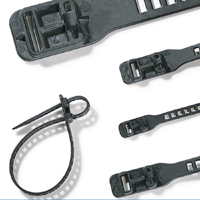 They are ideal for harness work in prototypes and come in a variety of handy lengths. A wide range of colours makes LR55 ties a favourite choice in logistics and packaging applications where they help code and seal items in transit. 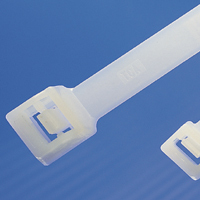 RELK and RLT offer unbeatable tensile strength in two different classes: RELK for forces up to 200 N; RLT with a loop tensile strength of up to 670 N for the toughest situations where releasable cable ties are needed. Today the thinner and softer insulation used on cables means the TEXTIE series of hook and loop ties are an invaluable player in any team. TEXTIE is quick and simple to use without tools. 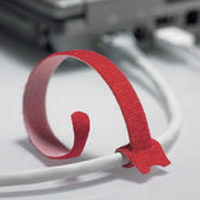 With its rounded and smooth edge, the SOFTFIX series of elastic and flexible cable ties has also been designed with prevention of damage to bundled goods in mind. SOFTFIX comes into its own whenever there is sensitive wiring or applications involving moving elements and vibration, such as in machines, robotics, pulsating tubing and conduits. SpeedyTie, with its quick release mechanism, is another versatile fastener that lends a welcome helping hand in many applications, especially for safe temporary bundling or fixing whilst cables and pipes are being routed. With its head release mechanism that allows it to be easily opened with one hand, the REZ series is the tie of choice for packaging applications where storage bags are used. The specially designed “kickdown levers” allows users to easily open and close the tie on a bag even when wearing gloves. 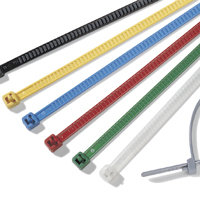 Looking for a cable tie with a “pre-locking” function? We would like to hear about scenarios where releasable cable ties have helped you, or perhaps your ideas for a new type of releasable tie. Please leave your comment or suggestion.